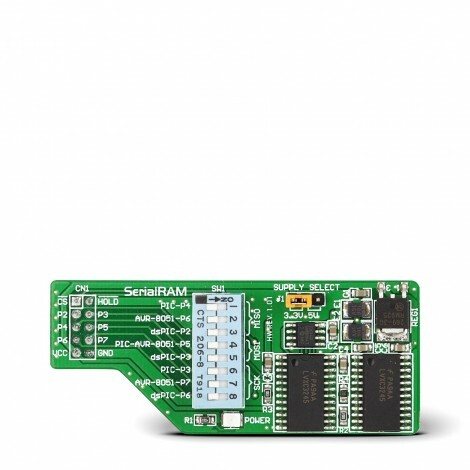 The SerialRAM Board enables you to use a 64 Kbit Serial SRAM device with your development board. The board features the 23K640 Serial RAM device that communicates with microcontrollers via a Serial Peripheral Interface (SPI). The SerialRAM Board features an 8192-byte Serial SRAM 23K640 designed to communicate via the microcontroller's SPI interface. It may also be interfaced with a microcontroller that doesn't have a built-in SPI port by using discrete I/O lines. Board features voltage translators that enable connection with systems operating at different voltage levels.